Tips And Tricks For Sensible Off Season Size-Building! Bodybuilders will go to all lengths to build massive muscles. One off-season practice that bodybuilders have been using since the first of them picked up a barbell is bulking up. This practice may need to fall by the wayside. The purpose behind bodybuilding is as the name suggests: to build the body, namely, in its purest expression, and in proportion and to capacity, the muscles that cloak it. Bodybuilders themselves will go to all lengths to build massive muscles, most naturally oriented, but many chemically induced. One off-season practice that bodybuilders have been using since the first of them picked up a barbell and ground out that formative rep is bulking up. Bulking up, a term used to describe the acquisition of as much size - both fat and muscle - as humanly possible through excessive eating and ultra-heavy training, is predicated upon the belief that gaining weight in whatever form will better enable the bodybuilder to a) lift heavier through the greater leverage and force generation it is thought to provide and b) provide a greater range and surplus of nutrients to allow for muscle growth along with fat deposition, the latter of which can be "stripped off" when the time for getting in shape arrives. Indeed it is not uncommon for some bodybuilders - even in today&apos;s game - to gain upwards of 40 to 50 pounds&apos; bodyweight in the off-season, much of this the very thing most of us first get into bodybuilding to avoid or reduce: body fat. Is bulking up effective? Theoretically it is possible that a massive off-season weight gain will provide some additional muscle mass, as experience has shown for many and in considering the fact that bodybuilders are less likely to deprive themselves of valuable nutrients at this time. So, yes, bulking up can be effective. But is it an ideal way to gain muscle and is it a healthy practice? A resounding no on both counts! Like many practices of yesteryear, bulking up is done less often among today&apos;s bodybuilders. Whereas before it was practiced by almost all, who would by virtue become almost unrecognisably fat, place themselves at risk of many health problems and face even more of an uphill struggle when it came to getting lean, today&apos;s smart bodybuilders, who recognize the health and aesthetic benefits of a comparatively lean physique, remain in shape year round so as to stay close to competition, or otherwise lean, striking distance. To stay in shape year round a distinction must be made between good shape and ripped conditioning, the latter being a short term goal comprising sub eight to six percent body fat that can only, for most, be maintained for a few weeks, the former being the lean, pleasing appearance that ten to 12 percent body fat will provide. While staying ripped can look most impressive, especially under the contest lights on the competitive stage, it can be detrimental health-wise over the long term as the body requires sufficient calories and body fat to function optimally on many different levels. Is The Fat Gain From Bulking Worth It? It Is As Long As Your Eating Healthy Foods. No It Just Creates More Work. It must be remembered also that the bodybuilders&apos; photos we see in the bodybuilding magazines show an extreme look that can only be acquired through much sacrifice and various interventions, some healthy, some not. It&apos;s a short-term look. Directly at the other end of the bodybuilding spectrum is the traditional off-season look: borderline obese with body fat levels ranging from 20 to 30 percent, or more; hardly a look representative of healthy living and one associated with bodybuilding aesthetics. Indeed, this is one of the major reasons the traditional off-season practice has become outdated: bodybuilders want to look good all year round. Two additional reasons, possibly of greater importance, are the health benefits staying in shape provide and, from a more practical perspective, faster muscle growth. And this is why finding the ideal balance between the two extremes is important for bodybuilding success and the promotion of good health. Switching between the two extremes - traditional off-season and ripped competition conditioning - can play havoc with our health. Gaining 20-30 pounds more than what we are accustomed to carrying will significantly overwork the heart, causing it to pump blood at a faster rate while it must adjust to the additional mass it is forced to support. Rapidly adding bodyweight can also cause joint problems as, while fat levels have become greater the joints themselves are still functioning as they were prior to the weight gain and often cannot handle such excessive pressure, and back problems as added abdominal fat pulls the vertebral column out of alignment. Most importantly for bodybuilders for whom muscle size is of primary importance, the bulking approach can also prove counterproductive. Theoretically the ultimate objective for adding excessive size in the off-season is to promote rapid growth. However, as well as this look being counter to what the bodybuilder strives in the gym to achieve, the loss of muscle that accompanies the eventual fat loss when we &apos;diet down&apos; negates any muscle that might have been gained during the bulking phase. It is simply not necessary to bulk up. It is also counterintuitive. It is much better to stay in shape and gradually add muscle, as you will not only look good all year round but will make permanent muscle gains over the long term. Dieting for ultimate conditioning will also be a comparative breeze. Bodybuilders wanting to stay in shape while making further gains in muscle often view this process as the ultimate paradox. Indeed, gaining muscle while staying lean is often considered as oxymoronic: both cannot exist simultaneously, so heavily entrenched has the outdated notion of bulking up become. Nothing, however, can be further from the truth; the main way in which to achieve more muscle while staying in good shape (around 10 percent body fat for males, 15 percent for females) is to disregard the notion that to be in top shape means self-deprivation. The key to gaining while maintaining respectable conditioning is to consume a wide range of quality calories comprising foods such as lean, wholesome, low saturated fat protein sources (including chicken, beef, fish and eggs), complex and fibrous carbohydrates for satiety value and valuable micronutrients (including brown rice, whole grain bread, sweet potatoes, broccoli, spinach and salads) and essential fats (including oily fish, and nuts and seeds). Maintaining a diet comprising around 2000-2500 calories from quality whole foods (for a 170 to 185 pound person with 10-15 percent body fat ) will give your body what it needs to grow muscle while offsetting the hunger usually associated with restrictive pre-contest dieting. Eating this way all year round will provide all the training energy one needs while allowing for steady gains in muscle. When diets become too restrictive we tend to seek out the wrong foods (fatty, simple carbohydrate, refined sugar dense junk foods, usually) under the misguided assumption that such food will enhance our training success. It is, after all, these foods that people have traditionally used to bulk up in the off-season. When aiming to gain size in the off-season it is best to gradually add additional calories in the form of complex carbohydrates, assuming protein is maintained at 1.5 grams per pound of bodyweight, as it should be for maximal muscle gains, rather than automatically bumping the intake to an amount to which the body is not accustomed. Closely monitor body fat levels so as to ensure they remain within the 10 percent bracket for men, 15 for females, while allowing - through intense weight training - the muscle conversion process to occur. As the body adapts to a certain caloric range - shown by stagnation in progress - add 100 more per day until muscle building resumes. Staggering calories - reducing the daily total by 20 percent one day and increasing it by 20 percent the other - is another way to ensure progress remains consistent; this - a way to confuse the metabolic rate into re-adjusting itself and therefore burning fat faster and using calories for muscle gaining more efficiently - can be done around once every two to three months for one week before resuming with your usual caloric intake. By eating excessively in the off-season many are compelled to apply equal overkill to cardio training in the belief that doing so will rid them of unwanted fat. In doing cardio we do burn fat but along with it a degree of muscle. 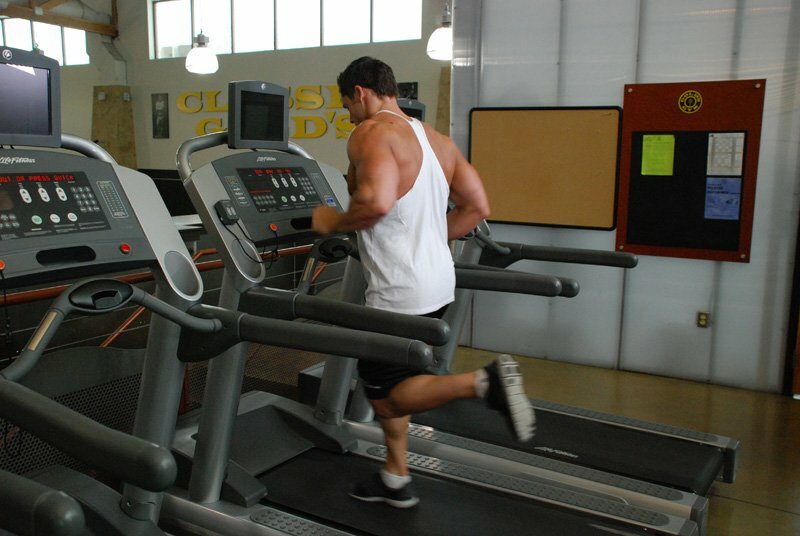 Cardio can be a hit or miss way to get into shape since it is hard to get it 100 percent correct. Too low in intensity and/or duration and we fail to burn much fat. Too high and we risk burning muscle along with the fat. Better to eat quality foods year round and weight train with mind-numbing intensity to build muscle, than to eat incorrectly and rely on cardio for fat loss in the off-season. Although cardio does have its place in any good bodybuilding program we could do well to determine exactly how much of it we need rather than do a certain amount and hope for the best. A good starting point would be to add it gradually (one session per week, 30 minutes at 70 percent maximal heart rate) and increase to no more than three times per week. Some even find that by completely eliminating cardio they are better able to generate strength for weight training workouts and build more muscle as a result. By following the nutritional guidelines in this article and forgoing the traditional bulking up approach, cardio becomes less of a concern, more of an optional extra to be used if needed. Cardio Has Its Place In Your Regimen, But Make Sure You&apos;re Doing The Right Amount For You. Overdoing training in general will tax our recovery abilities and stifle muscle growth. When adopting a more precise approach to packing on the muscle, as recommended here, it is extra important to ensure training frequency is kept in check. Since you will be functioning at a lower body fat percentage, and enjoying all of its benefits, you are closer to the extreme conditioning threshold of a low single digit body fat percentage. Since there are less caloric reserves to draw from there may also be a greater risk of overtraining. As mentioned, reducing cardio is a good first step. Increasing weight training intensity while reducing training sessions to four per week, training each body part once per week, two to three sets per exercise is another. Do not fall into the trap of thinking that since cardio has been reduced, you will need to elevate weight training frequency to compensate. The old adage that muscle is built outside the gym holds especially true here. Let your quality calories do their job and rest thoroughly before again pounding the iron. Muscle Is Built While Recovering So Reduce The Number Of Sessions And Up The Intensity. Bodybuilders tend to be extremists. We want fast results and we want them now, otherwise we assume that we are failing to gain sufficiently. Breaking with this mentality by acknowledging that muscle growth is, for most, and especially for natural trainers, a slow process will ensure you gain steadily. One of the reasons the off-season period is so popular is that bodybuilders can finally see the scale shift clockwise as the pounds pile on. Unfortunately much of the weight gained is fat, but so long as the weight increases most of us see this as progress. Not so. If we look more closely, quality muscle mass does not accumulate all that fast during this period. By forgoing the traditional off-season bulking approach we can, more readily, see how much of our weight gain is, in fact, muscle, and that is, after all, what we wish to build as bodybuilders. Be patient and enjoy small, steady increases in muscle size. Over the long term you will experience better health and permanent muscle gains (there will be no need to diet them off) that, upon compounding over time, will give you a body to be proud of. Since the body is more likely to grow to its muscular potential in an anabolic environment conducive to health and leanness of appearance, it makes sense to avoid gorging with fatty, sugary calories in the off-season in the hopes of adding a little muscle to the inevitable surplus of fat that will result. Feeding your body what it needs - not the kinds of foods that will clog the system and prevent growth - is by far a superior way to look and feel better while slowly and surely building quality muscle.